wholesale prices and dependable quality. We are proud to say that each one of our US Flags is made in the USA. Cotton American Flags are often used for attractive appearance for presentation or ceremonial purposes. These cotton US flags are not recommended for long term outdoor use. 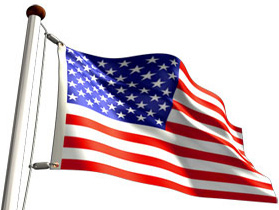 We do carry nylon US Flags and polyester US Flags that work great with durable outdoor quality. Each cotton US Flag has embroidered stars and sewn stripes and is finished with strong, white headers and brass grommets.